In our earlier blog post where we reported the rise in interest electric kick scooters, it becomes inevitable that new players will flood in to get a piece of the pie. We recently came across a new entrant by the brand of Coolpeds (https://www.coolpeds.us). 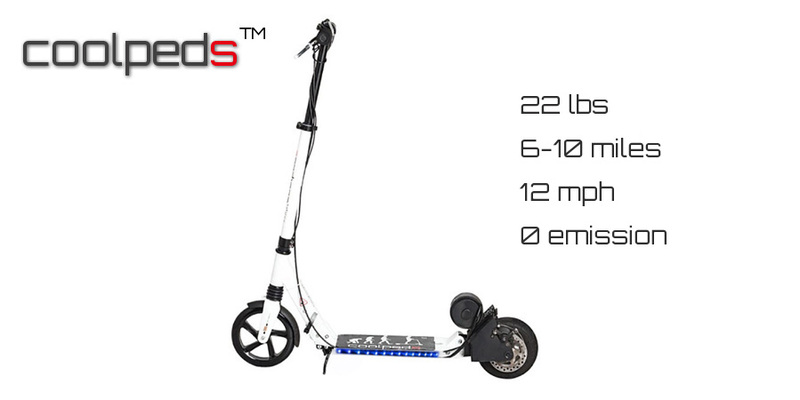 Coolpeds is a ultralightweight 10kg, and claims to have a range of between 10-15km. On the outset, the Coolped seem like a very functional, practical skate scooter with a small outboard electric motor and PU tires that are lightweight and meant for smooth pavements. However, peel open the top layer and you will begin to see a very amateurish operating model, with blantant copyright violations and stealing of proprietary material in their product design and promotion collateral. Coolpeds claim that they are from the US but every indication points to them being from China. Nothing wrong with being manufactured in China, most electric vehicles are otherwise they will be priced out of the market. However, if you look at their website (https://www.coolpeds.us), they use pictures from the Myway website (www.mywayi.com) as their own marketing material. Coolped has blantantly taken the full front page picture of the Myway website and used it on their home page and on every page of their website. Their marketing tactics aside, the Coolped is currently only available via online paypal purchase. We have yet to test one out but we shall follow up with a review of the test ride once we get our hands on one. After all, in the consumers mind, if the product is decent, all should be forgiven right? Wrong, when purchasing electric skate scooters or any vehicles for that matter, post sales service should be a major decision criteria. Instead of focusing on building a local distribution base with proper repair/maintenance services, they are using a direct selling method which has led to the downfall of many other e-scooter brands like the previously-esteemed Goped, Xtoor EX3, Razor scooters etc. In the vehicle or transport industry, post sales service is almost as important as pre-sales service. Further, the ultra-cool Coolpeds’ technology is nothing new, yet they say patent pending. We wonder what part is patentable? Their ultra-cool innovative marketing tactics or their re-imagined 90’s belt drive system? The Coolpeds’ low wheel base and motor mount is a direct copy of the Xtoor Ex3, their folding mechanisms belong to those of the Razor or micro scooters or E-SCOOTER (or any other China brand scooter for that matter). The list goes on. Of course, we won’t be too quick to pass a judgement on the Coolped without a proper test drive so we will wait for a local distributor here to bring it in before giving the fair review it deserves. I got my coolpeds already, and it is so much fun and cool to ride. They are much more inexpensive than mywayi as i checked, also much lighter. the miways are good but just too expensive for us. i went to their website but did not see the mywayi pictures you mentioned. also true that the coolpeds video was not an oscar piece but it didn’t show a sign of a chinese person. we know almost all scooters are made in china now, even the super expensive Miways are made in china. but Coolpeds are really designed and operated by a US based company as we confirmed by US friends i bought it. we received very professional and prompt replies from their US staff. Anyways, we are waiting for it to be available locally here and we will give it a proper technical review. We know of friends who have bought the Razor e-scooter via amazon and it was not what they expected. We are sorry to hear about the situation you are in. Did they ever give you a tracking number for the shipment? If not, they probably never sent it out. You can demand for a tracking number or airway bill. Every international shipment has to produce these official documents. Hi Jake, have you finally received it ?